While Google continues to make gains in social logins, Facebook refuses to relenquish its top spot and Yahoo just can't win. The big tech companies are having a showdown for the king of social logins. According to social identity solutions provider Gigya, Google continues to make gains, while Yahoo keeps slipping behind. As recently as Q3 2013, Yahoo held tight to 18 percent of social logins. However, Yahoo has since been losing traction, having lost a total of five percent of its share of social logins. On the other hand, both Google and Facebook have seen increases in social logins by two percent and three percent respectively. Google’s gains are even bigger on mobile. In fact, the company has gained six percent of the mobile social logins, a trend Gigya attributed to the increasing popularity of Android devices. This increase in Google logins via mobile seems to correlate to a two percent drop for both Twitter and Facebook. Google may be making gains in mobile social logins. The Gigya report indicates that Facebook has increased it’s already wide lead in e-commerce social logins. Facebook is also clawing back its lead in hospitality and travel logins, jumping from 50 percent in Q3 2013 to 61 percent in Q1 2014. 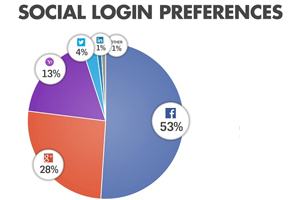 Check out the infographic below for more social login data from Gigya.